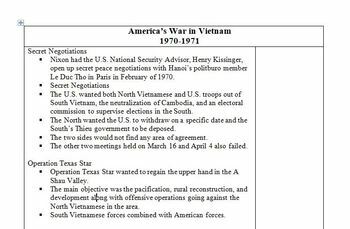 This 29 slide PowerPoint goes over the major events from 1970 and 1971 in relation to the Vietnam War. 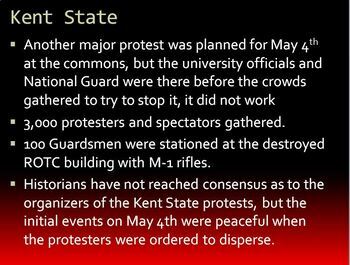 It discusses the failed peace negotiation, the Cambodian Incursion and the shooting at Kent State. 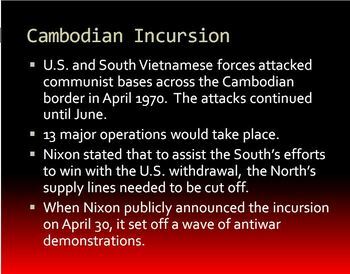 It also talks about the removal of troops, the invasion of southeastern Laos by the South Vietnamese. 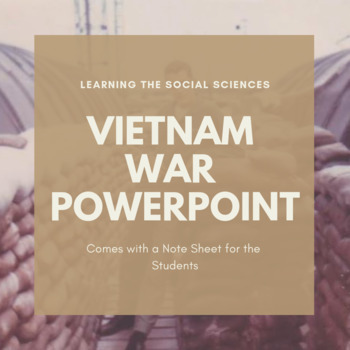 The PowerPoint also discusses the homegrown terrorist groups like the Weathermen and their attacks and the protests, specifically the 1971 march in Washington. There are plenty of pictures and links to YouTube videos to use as part of your lecture. There is also a note sheet that goes along with the PowerPoint. This PowerPoint goes well with the Ken Burns documentary series.